Joy Bolster, a Native American Hopi, designs contemporary jewelry that incorporates the rich cultural diversity that is her heritage. Jewelry making is in her blood. Both grandfathers were jewelry makers; one a Hopi silversmith and the other a German watch and fine jeweler. The cultural traditions in her family range from Traditional Hopi, Hispanic and German. 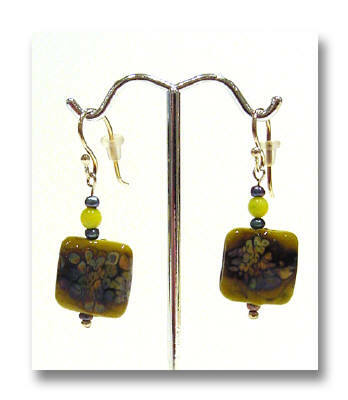 This mixture of backgrounds has allowed her to create jewelry that is highly appealing. Her pieces are easy to wear and resonates with the cultural diversity that our society is now just beginning to value and its need to reconnect with nature. "I see each component that I work with as part of our great Mother Earth. The material used for my jewelry designs have been chosen for their natural beauty and artistry. Along with the more primal stone choices I make, I also incorporate artisan beads, and silver elements from the Hill Tribes of northern Thailand, Bali and beads from other aboriginal peoples. The name Star Flower Stones came from Joy's Hopi name Blue Star Flower. "I wanted to use that name for my jewelry because of its connection to the Earth, the connection to my heritage and the feeling of Beauty and Light that it evokes. My hope is that when you wear my jewelry you feel a little more connected to our human tribe and Mother Earth."